We have conducted a survey on online merchants in Malaysia back in January 2014, in order to understand current setup, size, preferences and challenges faced by online sellers here. This time around, we have managed to collect responses from 227 current and potential online sellers in Malaysia, which is fairly sizable sampling for us to compile a meaningful analysis and infographic. You can click on the infographic below to enlarge it while the summary of facts & figures comes right after the infographic. If you refer to our report earlier on Malaysia's SME statistics, 99.2% of total business establishments here are SMEs. 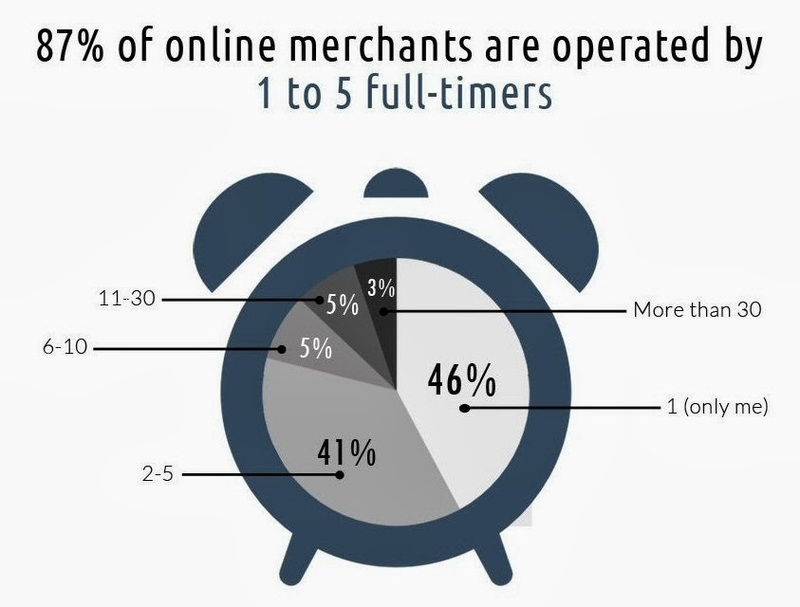 It is not a surprise that 46% of online merchants in Malaysia are one-man show, whereas another 41% are constituted by 2 to 5 full-timers. How about their monthly revenue? 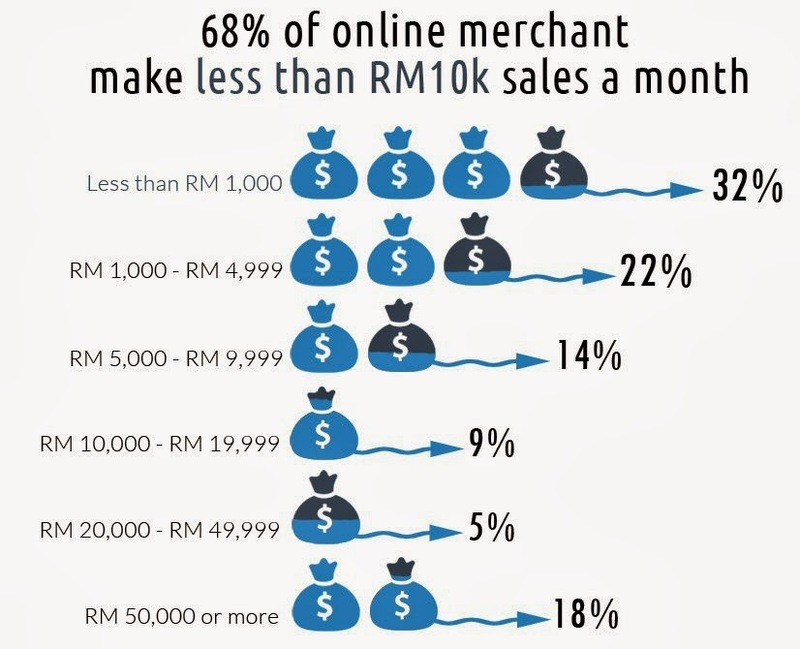 32% of online merchants in Malaysia are getting revenue of less than RM 1,000 a month, only 18% of online merchants here are pocketing RM 50,000 or more revenue monthly. If you are an online merchant, you might want to read this: 25 ways to increase your online sales (best tips, sales not guaranteed). Fashion & Accessories is one of the top categories online shoppers buy online, if you refer to our survey earlier on Understanding Online Shoppers in Malaysia. So, it is not a surprise that 46% of online merchants here are selling Fashion & Accessories, followed by Electronics (20%) and Health & Beauty (18%). 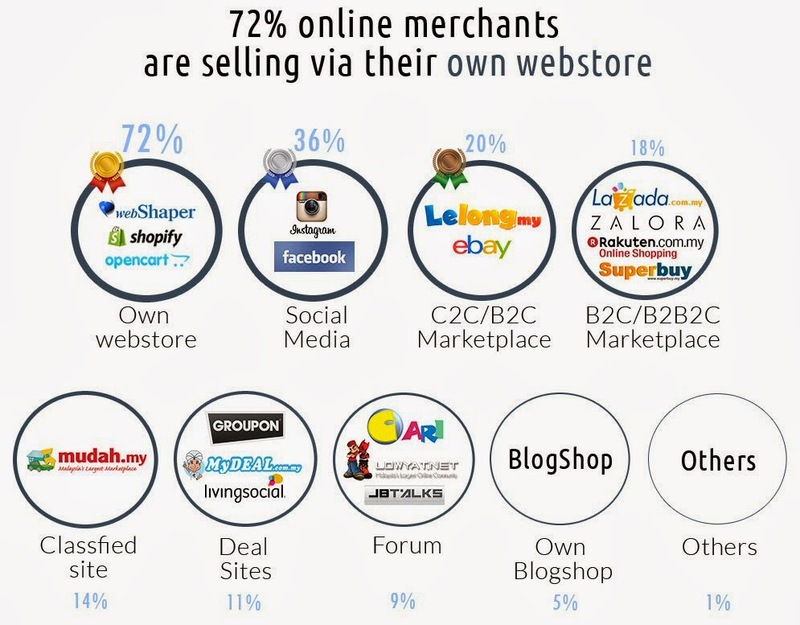 We have asked online sellers which platform they are using to sell online, and 72% of them setup their own webstore using service like webShaper. Since Facebook is the second most popular online shopping destination for Malaysians (refer online shopping infographic), it is not surprising that Facebook is the second most preferred platform for online sellers here at 36%. 20% of online merchants here prefer to sell via C2C/B2C marketplaces (like Lelong, eBay), while 18% of online merchants are selling via relatively more premium B2C/B2B2C marketplaces (like Lazada, Zalora, Rakuten, Superbuy). If you are interested to find out more, read all our articles on online marketplaces in Malaysia. 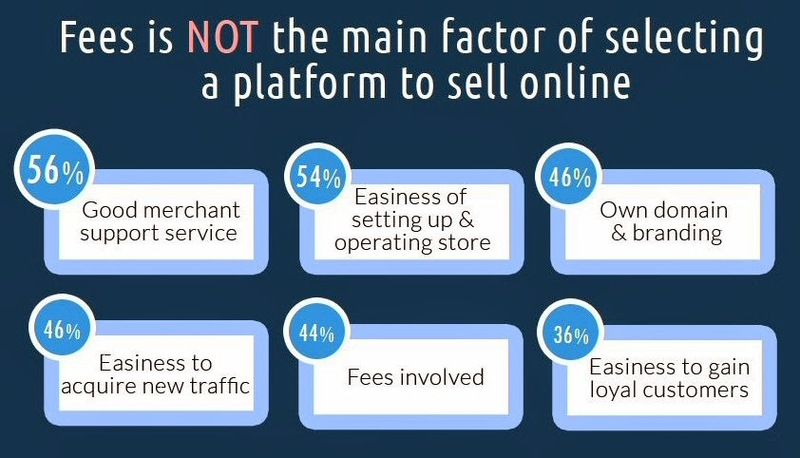 This is the question that we asked online merchants who are currently selling online: What are the main factors of selecting a platform to sell online? 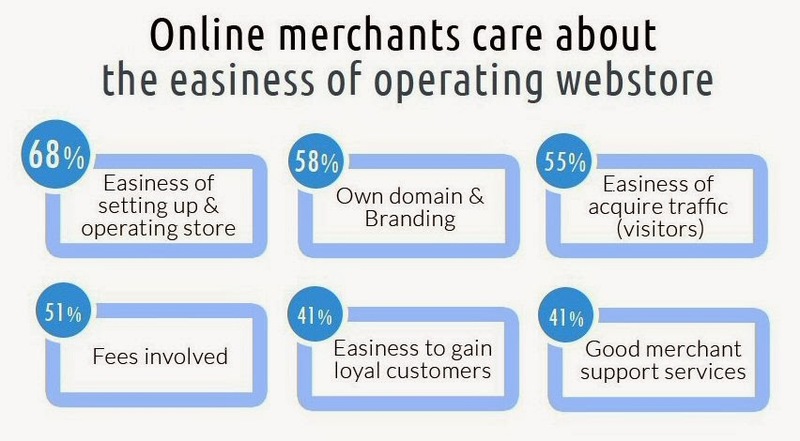 68% responded that the "easiness of setting up & operating store" is the first consideration, followed by "able to have own domain & branding" (58%) and "easiness to acquire traffic" (55%). Platform aside, we have asked online merchants another question: What are the areas that you face the most challenges in your e-commerce business? 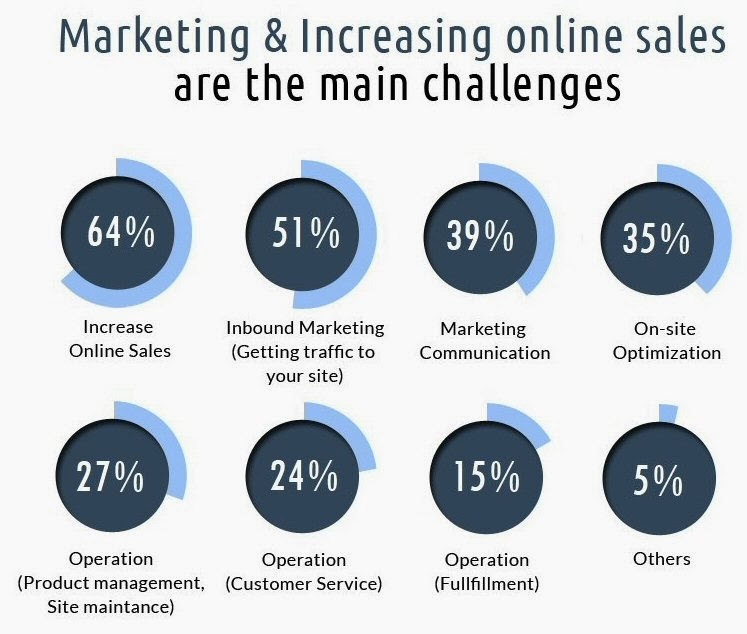 No surprise here as 64% of online merchants are facing the primary challenge on increasing online sales, followed by getting traffic to their site at 51%, and (BTL) marketing communication at 39%. For survey respondents with intention to setup e-commerce in the near future, 74% of them prefer to start experience selling online via social media (like Facebook, Instagram). 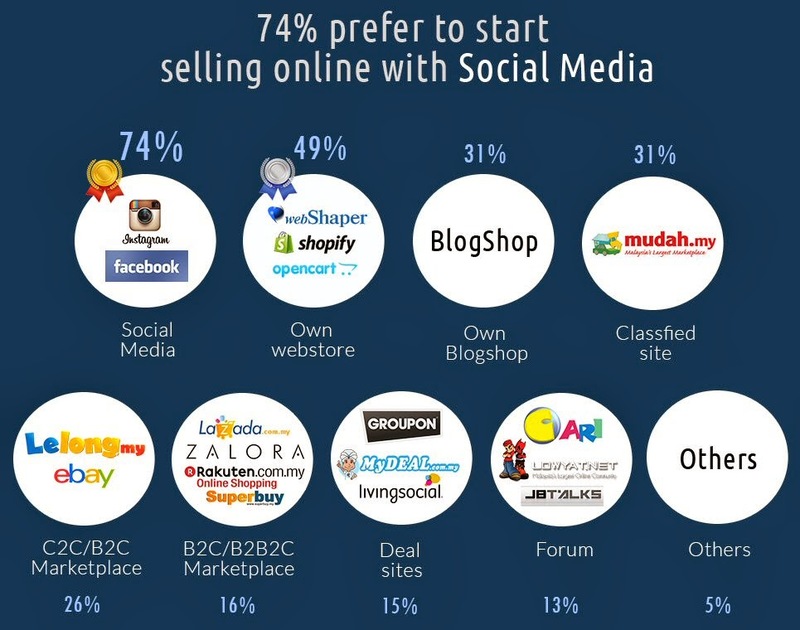 49% of them prefer to choose own webstore, followed by 31% each on blogshop and classified site like Mudah. Surprisingly, online marketplaces are not in the top list of potential online sellers to setup their e-commerce business. As this could be their first time selling online, most potential online sellers emphasize on "good merchant support service" when selecting a platform. 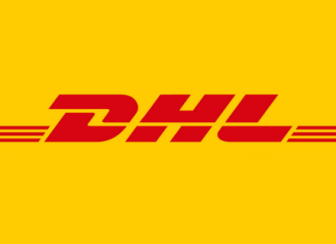 What budget they have in mind to start e-commerce business? 44% of potential online sellers are willing to invest less than RM 1,000 to start their e-commerce business, while another 23% are willing to budget anything between RM 1,000 and RM 2,000. For more details, head over to the full infographic on our Pinterest board. Don't forget to follow us on Pinterest for more compilations of e-commerce infographic and charts. Thank you to all survey respondents for your participation. Last but not least, special thanks to webShaper for making this happen.